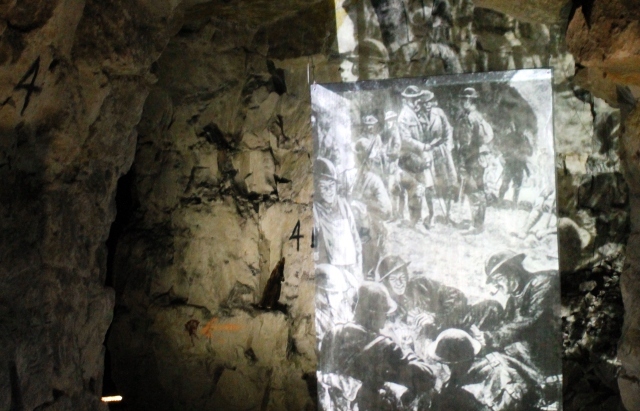 Entering the ancient quarry, at first it was almost impossible to imagine what it must have been like in April 1917, when 24,000 British soldiers prepared to emerge into the midst of enemy lines in what was to become one of most renowned surprise attacks during World War 1. Wellington Quarry (La Carrière Wellington) is housed in a contemporary museum in Arras. 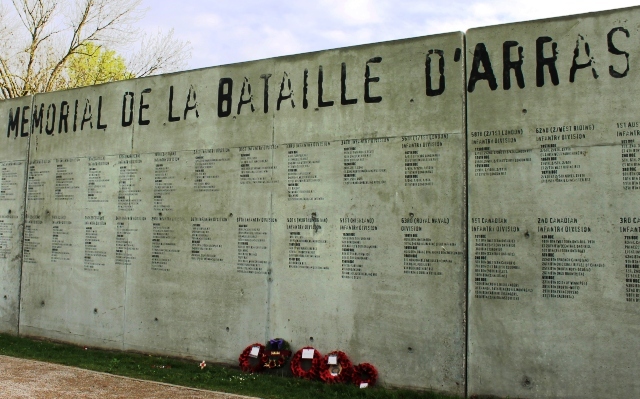 The Memorial Wall names the many Commonwealth troops that lost men during the Battle of Arras. A row of rather forlorn poppy wreaths rested against it, including one from Canada, a reminder of their key role in WW1. 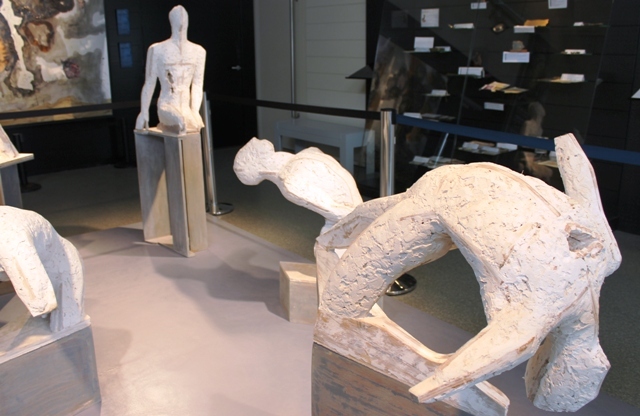 Having had a look round the foyer exhibition of posters and an art installation of plaster sculptures vaguely reminiscent of the tortured figures at Pompeii, we given helmets and headsets and got into a lift to go 20 meters underground . Well-lit with a circular map outlining the battlelines, listening to our guide explaining historic facts and military strategy, I had a feeling of being on a school trip to a rather dry War Museum. Of course, I was supposed to be moved by the enormity of it all but to be honest, I was feeling rather detached. I was on a weekend trip to explore some of the WW1 sites in northern France. The previous day we had been walking in the footsteps of WW1 poet Wilfred Owen from visually inspirational La Maison Forestiere through birdsong woods and fields to his grave at nearby Ors. That had been a very emotional day and I was wondering what impact this visit could have. Because that’s the thing about these war sites – there is a weird expectation that we must/will/should be moved and a strange fear that we might not be. 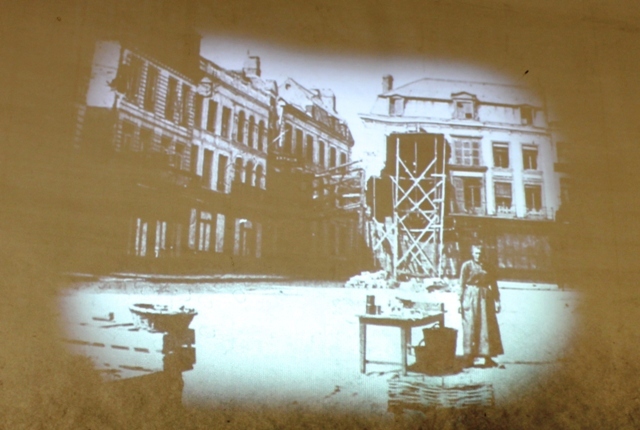 Projected onto the uneven walls, black and white photos flickered and through our headsets we heard stories of the destruction of Arras and the occupation by British Forces, the only part of France to be under British governance during the war. Its strategic position on the Western Front, bang in the middle of warring on both sides meant 3/4 of the city was destroyed. In the lead up to their emergence into the German battle ground, about 24,ooo men were billeted here for 8 days. What must they have been thinking during that tense time? 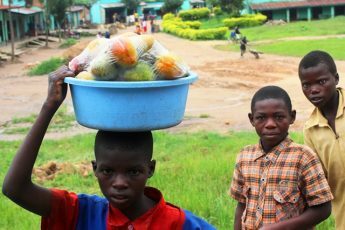 Even playing cards, writing letters home, cleaning kit, cooking and preparing weapons can surely not have kept fear at bay. Yet the true horror of this ‘Great War’ was not fully realised at the time and they were hopefully feeling positive about victory. An extract from a soldier’s journal was very poignant listening as was the sight of everyday objects, including tin plates and jugs alongisde a pair of big boots lying beneath a rickety looking bunk-bed. Gradually the claustrophobic atmosphere made itself felt. A plain table and cross showed where they may have prayed before the ‘push’. 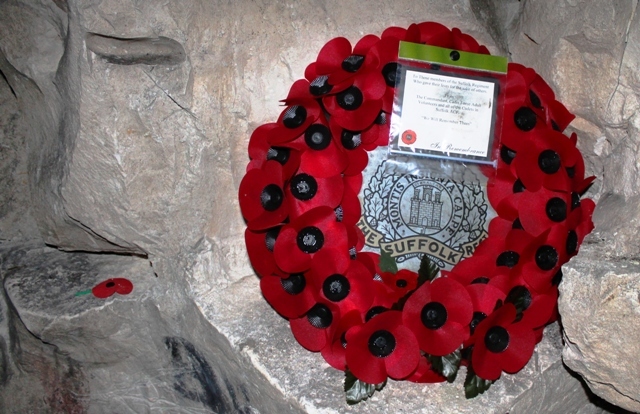 A wreath of poppies in honour of the Suffolk Regiment had been left by recent visitors from the UK who come here in huge numbers to learn more about this significant moment in history. The 1917 Battle of Arras took place between 9th April and 16th May. After initial success for British troops due to the element of surprise it became a bloody disaster. There were almost 160,000 British and about 125,000 German casualties. 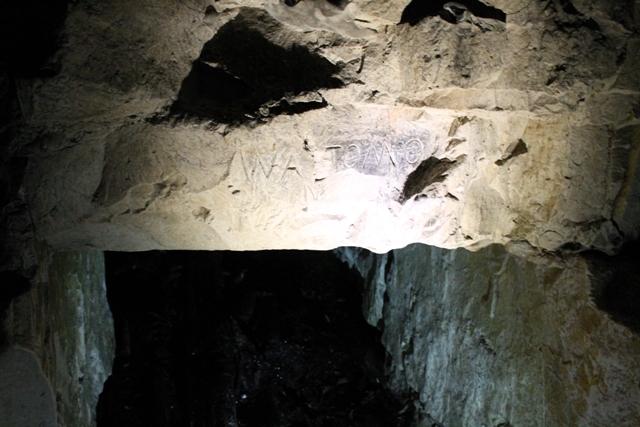 And it’s this knowledge that makes a visit to the Wellington Quarry such a memorable and thought-provoking experience. The war damage has been repaired and the main squares are masterpieces of restoration. 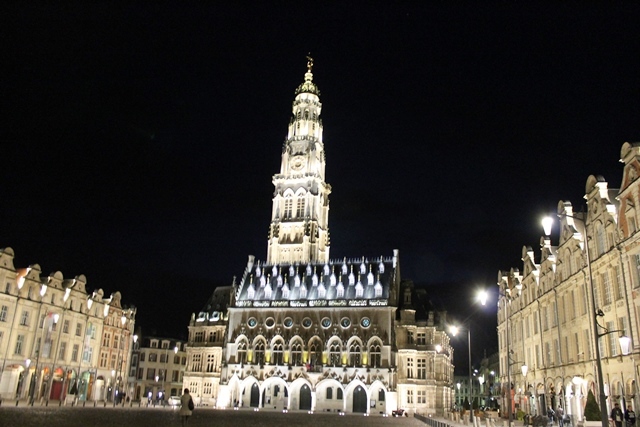 With a splendid Belfry, surrounded by Flemish Baroque townhouses with arcades of restaurants and cafes, it’s difficult to imagine that beneath the city lies a huge complex that so sensitively commemorates the brave soldiers who passed this way. 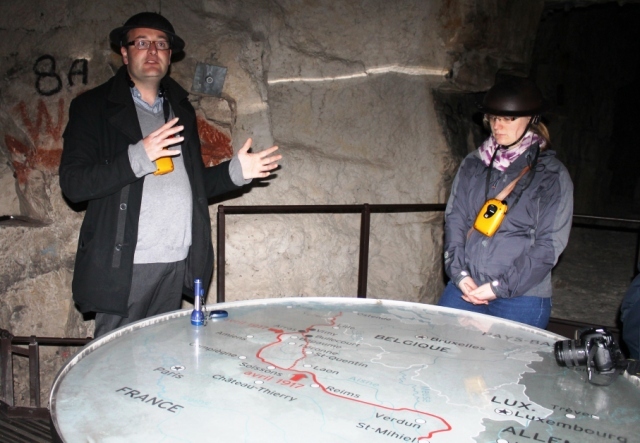 I travelled to France as a guest of Northern France TourismNorthern France Tourism. 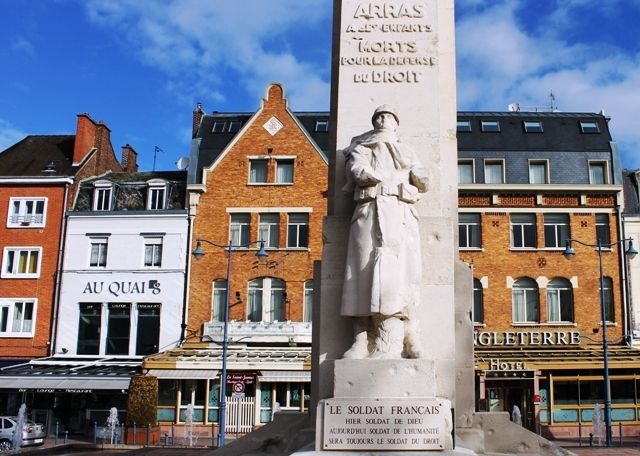 We stayed at the charming Hotel d’Angleterre in the centre of Arras, in front of which stands an impressive war memorial to the many who died in two World Wars. At this time of remembrance and the centenary of WW1, visiting these historic sites is a truly effective way for those of us who have had no experience of war, to get some inkling of what that dreadful period of our history must have been like. I found this visit incredibly affecting. It must have been an amazing engineering feat. Bet it was very cramped working in those conditions. But what a waste of young lives in that awful war. It was very impressive John but yes, the loss of life on both sides was dreadful and so often just for the sake of a few hundred yards of land. 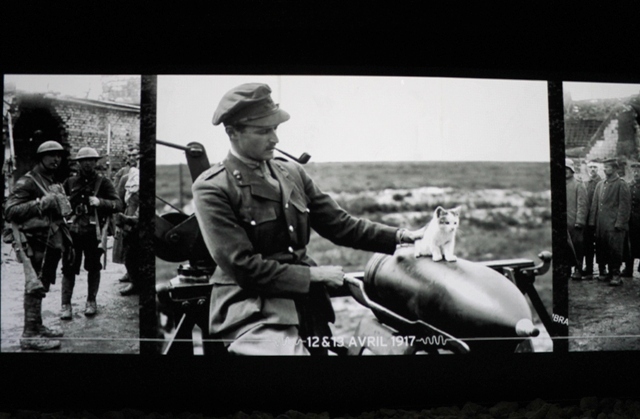 This trip made WW1 a bit more graspable and was really compelling. Wow, this is impressive in many ways. Very interesting to visit history like this. Yes, Mary it’s a great way to have it brought to life, but as ever, can only give a little glimpse of what the reality mush have been like. Arras is a lovely town now and the scars of war are barely visible. I’ve been really enjoying reading stories this year in connection with the centenary of WWI. I hadn’t heard much about Wellington Quarry so this is quite interesting. I can’t even imagine what it was like for the men back then in these situations! Yes, it is important we don’t forget the huge loss of life but also incredible feats of engineering and accomplishment during that awful war. Thanks for your commment Michael. 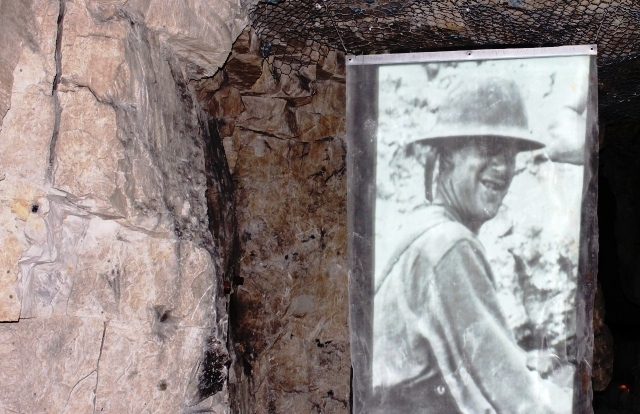 It’s only when you are actually in the tunnels that you begin to relasie what it must have been like – but we were a small group and they were thousands … Incredible accomplishment. Today is a time to remember my Grandfather Lieutenant John Vercoe-Rogers whilst serving with the 78 Bn.Winnipeg Grenadiers Manatoba of the Canadian Expedtionary Force was Killed in Action, 27 September 1918 . Whilst clearing the enemy from Bourlon Wood towards the Canal du Nord, Nintey Seven years ago today. Buried at Quary Wood Cemetry. Thank you so much for sharing this David and I do hope you get to see where your Grandfather is buried.